Kidsonroof: Being Green Was Never So Cool! Earth Day is turning forty.... Wait, fooorty? ... That really makes me think about how long it has taken to spread the message... Getting people to love and respect Earth, not only with pretty words, but with their daily actions and turning individual efforts into community habits... What an effort!! Definitely, four decades of tiny "turtle" steps. As I remember from childhood, our environmental education was just about keeping cans and candy wrappers off the street . These days things are different. Instead, we get to be parents in a world that invites kids to "be green". The words "Reduce, Reuse, Recycle" seem to be well printed in their little minds and everyday, we find more and more products with an ecological approach. 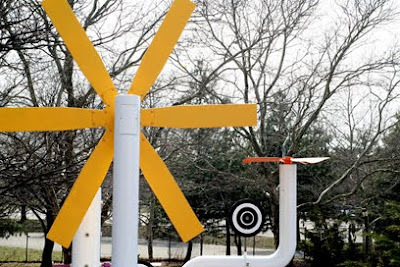 Goods that don't represent a toxic threat, designs that allow us to show our children how modern life and nature can re-connect. How about re-connecting with nature in a playroom like the one above? Eco friendly? Yees, and so beautiful... right? It's Volume Zero, the latest furniture collection from Dutch company Kidsonroof. Chairs, matching benches and tables are included in this new line, all constructed with solid beech wood and finished with waterbased paint and lacquer. 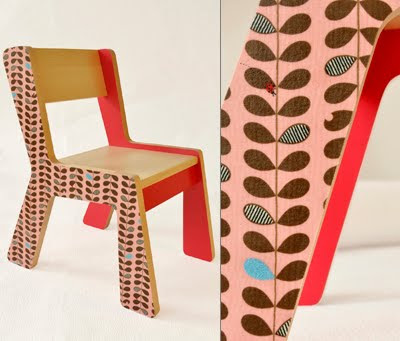 The delicate prints are Japanese fabrics attached to the wood with waterbased paint. Eco-friendly toys? Sure! Kidsonroof re-creates the traditional dollhouse and comes up with a thorough makeover. The modern version of the old country dollhouse is now a recycled cardboard mansion with the "countryside" already printed on it. The MobileHome Recycle! 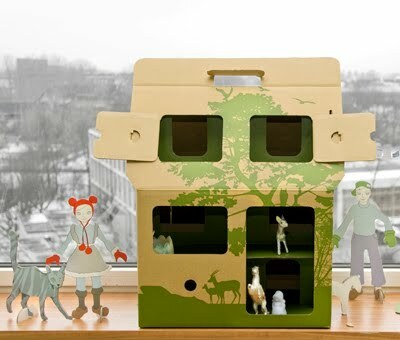 is the brand new addition to Kidsonroof's Casa Collection. A portable house in either color, green or purple with eight rooms, an attic and spy holes for pretend birds or maybe dolls to check on their neighbors... Who knows? Luckily for our friends in Europe, Kidsonroof has all of its products available online and ready to ship from Amsterdam. For us, here in the USA, these new dollhouses will be available in May and the Volume Zero furniture, so sorry to tell, will probably be available at the end of this year. Meanwhile, if you really, really must have it, you can always order it from Europe. What do you think? Isn't it true that "being green" was never so cool? Happy Earth Day, everyone!! Tell us what you will be doing today? ...Whatever your plans are, make sure you enjoy nature, share it with your kids and help them realize how lucky they are to be here, at home, on Earth. Now that it seems safe to venture outdoors... Now that the weather is all good in New York... Now that everything seems so cool, we get another issue to bug our minds... Where do we take the kids to? 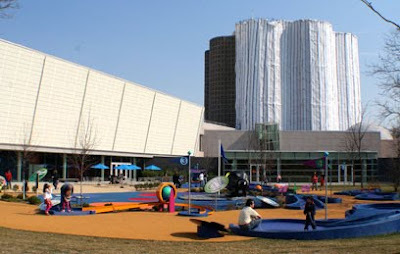 Where can we go that is fun for the whole family, entertaining and educational, a combination of outdoors and indoors? Wheeeere? 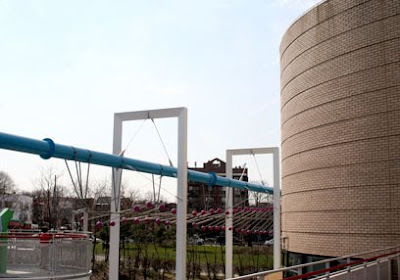 New York Hall of Science (NYSCI) is a place that you definitely must add to your list of favorites and please, underline it with red marker, so you don't forget about it. We were recently invited to a NYC Bloggers' Open House and spent a wonderful family day there... Really, this place is nothing, but great. 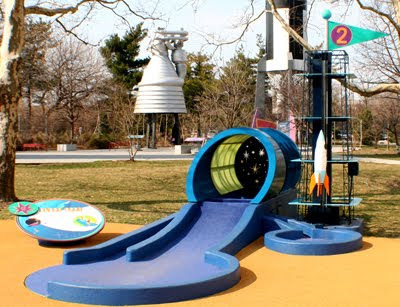 There was plenty of entertainment for everyone, hands-on science experiments appropriate for all ages and outdoor areas that make you feel like you bought a ticket for a ride on "Back to the Future" ....Awesome!! 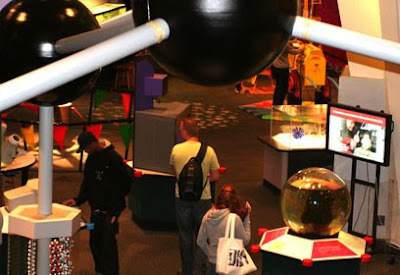 Walk around two big floors filled with over 450 exhibits and get not only your kids', but also your inner Einstein awakened... Microbes, atoms, molecules, live dissections, magical rooms, tricky mirrors, so much science around inviting everyone to experiment, to touch... Isn't that great? Yeeess!! 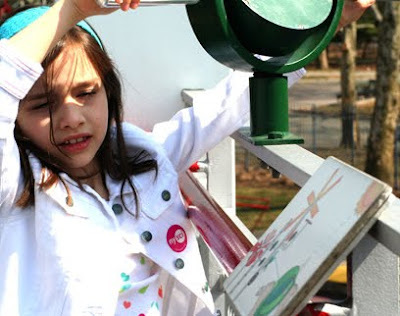 NYSCI, a place where touching is allowed and experimenting is all right... Almost paradise!! Talking about experimenting, NYSCI took all of its "hands-on" concept outdoors and as a result, you end up exploring a very original place. 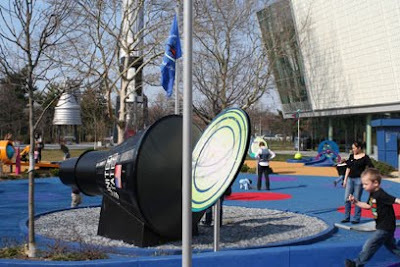 The "Science Playground" has the perfect chemistry, an equal mix of fabulous design and fun learning... Science meets modern art and all of a sudden, you find yourself pushing your child on a swing that is also a wind mill, while admiring the surrounding sun catchers and kinetic sculptures... Are we on Earth? Woow! 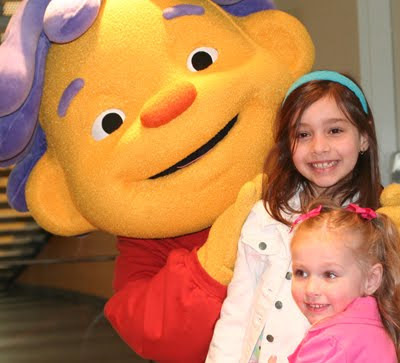 Done already with the secrets of spaceflight and golf, it was time to meet Sid the Science Kid from the popular PBS Kids Show... Who else could be hanging out at NYSCI, but Sid the Science Kid? Making plans already for the weekend or looking for a venue to celebrate your child's birthday party? Think of NYSCI. 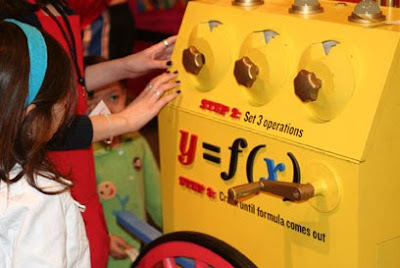 They also offer different packages and themes for parties including crafts or science activities, use of the different areas of the museum and a party room... 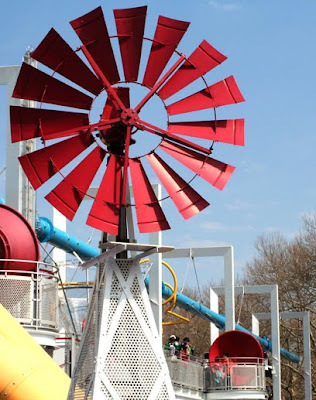 It just became my kids' new favorite place... and I loved it too! !